700 years ago, the town of Thrushmoor simply vanished. The residents all just disappeared one day, not just the citizens, but the animals as well. The most common rumor was that a witch stole the people to eat and feed her magical power, though this remained unproven. This was a common rumor until Count Haserton Lowls I, newly lorded count of Ustalav's Versex Country, decided to put an end to such foolish ideas, wanting to erase this thought of evil witchcraft causing the country to be in fear. Having invited the church of Pharasma to perform a mass exorcism on the town, the Pharasma exorcists spent days cleansing the town and searching for the source of the evil. After many days, the Count declared the town was cleansed of all evil haunts and spirits, the town slowly becoming re-populated. For enlightenment over the town, the Count, with the aid of Rozenport's Sincomatki School of Sciences, constructed the Briarstone Asylum, claiming the the time of superstition and fear would end, as the people could now seek help against their fear. The hospital became notorious for it being a safe haven against mental illness, with trained doctors and assistants to try to cure the worlds issues. The party shall begin the adventure together in a mysterious city, on the hunt. Though they will wake up afterward in an asylum, with no memories in tact! Have a very consistent post rate, at least once every two - three days, unless we are on pause for someone's emergency. If you cannot keep playing, I will NPC your characters until they can leave the party. We will have a Discord channel for communication. If you cannot access it, please tell me. Backstory: Describe the past of your character and how they got to how they are! Does not need to be massive, but enough that we get an idea. I request you supply any fears or traumatic events, as the campaigns story can use them. to redeem yourself and banish this unsettling emotion. let that fear control you. It doesn’t feel like it’s worth worrying over too much. head. You’ll take the fight to them. you greater perspective into an otherwise confusing world. investigate your current dire situation. Choose three Knowledge skills. to set off, and your first instinct when pressed into a corner is to lash out. you used these skills in less-than-kind ways all too recently. at times, especially in your current situation. chance that this attempt is successful. In addition, select one domain or inquisition you have. You can use the first granted power of that domain or inquisition one additional time per day. around you, aside from your companions, might threaten you and you’re always ready to react. that keeping these feelings honed will help you stay alive. Last edited by Krow Nest; 01-13-2019 at 08:11 PM. Deity: So far in life he hasn't taken the time to pay attention to any of them. Elijah is naturally a somewhat imposing person. Strong "commanding" features placed on a six-foot-three frame are just the foundation -- his sparkling amber eyes speak of well-honed intellect that is as useful as it is dangerous. He is not charming per se, so much as you simply realize you're around someone who knows who they are and what they are doing...and that you had best not get in the way. At his core, he is still just a good-hearted young man with a bit of a "my life, my way" attitude. The problem, of course, is that he has long practiced overriding this core, which means that most of the time you'll feel the side worn into him by the service. In this case, that means someone that doesn't see life as all that valuable, who dismisses tragedies without compassion, and whose only prevalent goal seems to be whatever suits him the most. On the flip side, the fact that his "outer shell" is a result of military service also means that he highly values close friends (even if he doesn't entirely trust them), is absolutely committed to a goal once he actually sets one, and ultimately considers self-sacrifice as part of the job. His clothes are what he's taken with him from the job, and are also gifts from his parents. 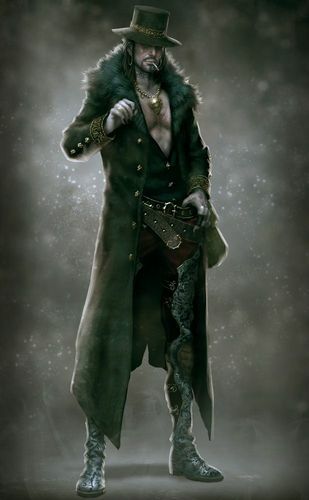 Greyscale Snakeskin chaps with attached boots, fur-trimmed officer's trenchcoat with gold thread on the cuffs, silk vest, and wide-brimmed hat with matching cold thread...he finds it comfortable, but it also sends a message about the type of person he is and the type of job he has. As does the gold pendant he wears -- a simple chain with a wolf's head, the symbol the Lone Wolf division of the military. His second, wider belt holds his pistol, too -- at a glance just a fine pistol, but there is something strange about it you can't quite peg...or perhaps it's just the aura of the man himself. The pale skin and bright amber eyes have -- along with the reputation he has among people that recognize his pendant -- suggested to some he might not actually be human after all. Then again, anyone who watches him closely would notice that behind the rough mask, the heart of him does show through. He's prone to place a lot of value on the small things, never really being one to care if he gets credit. Finding a child's lost toy, feeding a stray dog, mending an old man's hunting rifle, or even just putting a wounded butterfly on a flower in the sunlight. The strange, spontaneous little actions that, if truth be told, likely mean more than the carefully calculated actions for which he feels so conflicted. It haunts me, you know? Sometimes...sometimes I wonder where the line between good and bad is. I was a smart kid, and probably a bit of a trouble maker, but in the end I was still a good kid. Parents gave me a better life than most, I got trained in the best schools, and then sent to the military academy. My folks have always been military as far back as anyone bothers to remember, and I was rowdy enough for it to appeal to me. I always had that kind of camaraderie with the guys, and people tend to look up to me. Honestly I can't remember a damn thing from the first couple decades of my life I really regret. I made do with standard military, but we were just stationed at the capital, so I was in my home city anyway. Problem was when we were sent active duty during a minor conflict. Simply put, my superiors hated my whole personality but loved my talents. I was already in a specialist unit that used firearms, but I found a way to use my gun that went far beyond anything anyone else could do. So, I was trained to be one of their "Lone Wolf" soldiers. Long story short, I was happy until I found out it was a fancy name for someone sent to do the work they couldn't officially send anyone else to do. First few years I was a total mess. Oh I did the job, don't get me wrong, but I handled it like paper handles fire. Time and habit, though...they can do something. I didn't go the route of some people in my job. Some of the guys I knew...they were just monsters on a leash. They enjoyed their job far too much for any sane person. Others I knew, rest their souls the stress got to their heads and broke them. Me? I learned to detach. No matter what I saw, no matter what I did, I could wrap a wall around my mind and soul and keep things down to just doing what I did. The problem though...the problem is that it doesn't really work entirely. I've been doing this job for nine years. Nine years. You know, sometimes I just wonder if I'm actually doing the right thing? I like to think I'm still the good guy, but sometimes being the good guy in this job doesn't seem good at all. That's the whole reason I'm on leave right now. First time I've taken leave for more than a couple days. I've been in the service as active duty for ten years total -- one year in the conflict before I was re-assigned -- so in honor of ten years of service they agreed to give me off for as long as I wanted to get my head straight. I just...I've got ghosts, you know? I drink too damn much, smoke whatever the local apothecaries and herbalists recommend. Helps keep me clean of the ghosts. Not the real ones, of course -- not sure if I believe in them, because if vengeful ghosts exist I'd probably be dead by now, or maybe I'm just loaded with blind luck. But after this much time, the walls I built for my mind have been worn down in places. When I'm awake I try to keep busy or at least occupied with whatever will keep my mind from wandering out of it's safe little box, but sleeping is another matter. I can't maintain the walls then. It's not trauma. I've seen men who jump at the sound of a fork on a plate because they think someone is pulling a knife on them. Seen people who jolt out of sleep looking for assassins that are never there. I'm not that guy. I'm not the best, but I'm good at what I do, and have tricks most people wouldn't dream of. Nah, for me, I guess it's guilt. I think some deep part of my knows that there is no way some things I've done are good, and I hate it...but I can't undo it. I can't keep myself from seeing innocent faces, ruined lives, chaos...because of me. Sure, I'm supposedly keeping order and peace and law, but...still. Anyhow, that's the whole reason I'm off now, really. Damn my tenth year of service, I don't care. I like fighting. Problem is you can't really call what I've been doing "fighting" or "soldiering" at all, and when you start to question the morals, motives, and nature of your superiors and orders...it's time to slip off the insignia and get yourself straightened up. Unfortunately...this happened. Whatever the hell "this" is. I've seen some crazy stuff in my days, but this tops them all. It's weird, because it's all like some kind of messed up dream. I'd call it a nightmare, but like I said. I've got too many of my own ghosts for something like this to get to me. I guess when you deal with demons it starts taking more than hell to scare you. Besides, I'm a soldier, right? That's the whole point. Get these cobwebs out of my head and get back in the field. In my job we don't have time for fear. I remember reading a poet somewhere wrote a line I used to live by: "Theirs is not to reason why, theirs is but to do and die." If this...thing...that happened turns out to be part of something new I'm gonna be dealing with, perhaps shooting it out with some real monsters will be just the thing the doctor ordered. After all, when is the last time getting all worked up helped anyone? Elijah is a wizard, with wisdom as a low stat. He's not an "actual" gunslinger -- instead he combines the role of Ranged Damage and Primary Caster into the same person. That said, he is primarily a Ranged Damage character who happens to have casting too. My focus is more towards that role largely due to the school limitations and simply the intent of the character. I'd like to end up going Eldritch Knight (if the campaign runs that long/it's allowed) to take advantage of a better BAB progression. Dip into Urban Barbarian for a nice floating boost on demand and the weapon proficiency. The reason he can actually do good damage despite his BAB is twofold. 1) Sacrificing spells = +1 enchantment/spell level for minutes/spell level. I can add actual enchantments as well. This is the most efficient way to do things at low levels since the gun is more dangerous than any spell at level 1. It's already a masterwork gun, and he's got decent attack, so all told he'll most likely hit (esp against touch AC), and then slap on the pistol damage plus XYZ enchantment. Something like 1d8+1d6 is a decent lvl 1 damage, and that effect would last for 1 minute, so instead of a single spell I could do that for a whole encounter if I needed to (or multiple encounters). Obviously as I get more/higher level spells this becomes more useful. 2) Shooting spells: he literally shoots all ray, ranged touch, cone, and line spells through the gun. Based off the text this doesn't make them all attack rolls (although ones that do need attack rolls get a boosted crit multiplier), but what it DOES do is boost the DC by the gun's enchantment. So since I'll just be sacrificing a spell to boost the gun anyway, essentially while I'm already boosting attacks I can further boost my spells for free. Works out rather nicely. Especially by low-mid levels when I've manually enchanted the gun so I get it passively. Also, the nice thing is that unlike other ranged characters he NEVER has to worry about ammo. The spells Blood Money and Fabricate Bullets means that he can literally just cut his palm and turn his blood into bullets, which is probably the most badass thing about this whole archetype. Sure, it's not the most efficient way. But that right there is COOL. (As a side note, without needing STR Blood Money is an easy answer to most component problems, even with Eschew Materials). Last edited by Alphaeus; 12-30-2018 at 01:47 AM. Description: Standing at an average height of five foot eight, with shoulder-length, chestnut brown hair and hazel eyes. As a Varisian, her skin is lightly tanned. Furthermore, as a devout follower of Shelyn, her appearance is well-kempt and her face, if not for the subdued beauty of her figure, she is a soft sight for sore eyes. 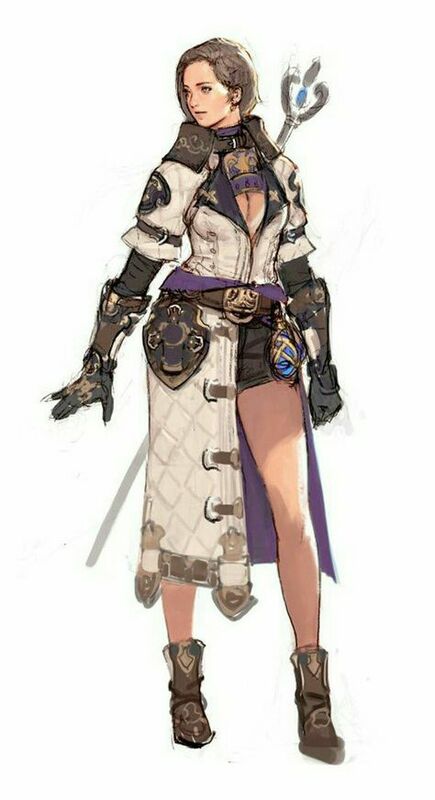 She is dressed in rather boyish attire, consisting of pants, boots and doublet, all made of leather, the boots and sleeveless doublet, however are dyed a darker tone than her breeches. Under the doublet is a fitted linen shirt, bleached impeccably white. To adorn her outfit, the buckle on her belt as well as the amulet about her neck are the songbird symbols of Shelyn. Carried with her is a well-made glaive, covered in a leather blade-sheath. Backstory: Cheryl is a native to Ustengrad and, in the early years of her life, her family had moved to settle in the town of Thrushmoor seeking opportunity in making a claim as one of the first merchant families in town. They were not the only ones, but they did compete in the selling of cloth goods, for how much the market needed them. As a child, Cheryl was the youngest member of her family in town, and she had two older brothers to compete with the vie for the attentions of her perpetually busy father and mother. In the efforts to seek attention, Cheryl and her brothers oft got into small fights that she had no chances of winning. There were times too where she wandered outside her household on her own. That is when she had witnessed a dire rat lurking the streets within town. She followed it for a time being to a nest, and from there she ran, but the beasts had not given chase. 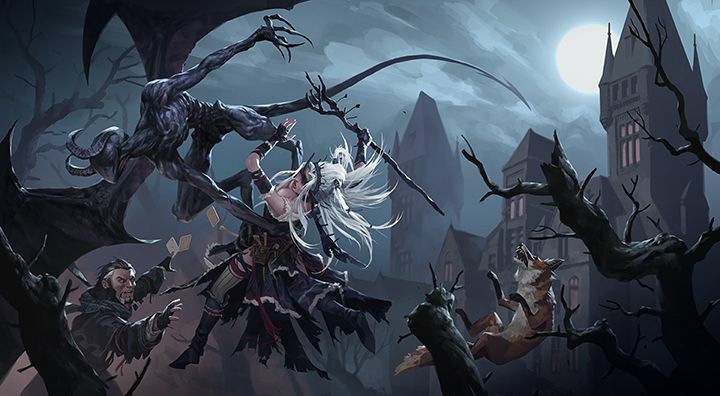 She, while growing up and exploring town, had seen more of such beast, but had been unharmed in these encounters fermenting more fascination rather than fear. Years later, during adolescence, her parents, seeking a use for a girl that now showed an interest in monsters, if the drawings under her bed were any evidence, decided it would be best to send her away to some church for schooling. And, outside the provinces of Ustlav she was sent, seemingly at random to a church of Shelyn. Typically artists whom have lost their inspiration sent themselves to learn from the Eternal Rose. There was some confusion as a merchant's daughter, not an aspiring artist came to their beacons of culture. Abandoned there, Cheryl learned. Her gift with drawing was poor, her paintings lacked spirit and she could hardly carry a tune. But she was patient, and the priests were patient with her. She learned how to tell stories and how to give speeches. She was taught how to wield a spear the way a painter wields a brush. Many summers had passed since she was abandoned to the possibility of becoming a divine muse. Instead she, through revealing some controversial stances on beasts and other monsters in regard to their beauty, she was taken in by reformists, taught a gentle touch on how to not harm living creatures with the work of the blade and how to persuade, at the very least, sentient beings how to channel their energy in more constructive ways. By the end of her training she was seemingly beholden to no vow or guidelines. She became an inquisitor of Shelyn as a grown woman. Last edited by Vaerdis; 12-28-2018 at 09:37 PM. Lovecraft meets Pathfinder? Count me interested Any day! If possible, I'd like to request either Alchemist or Investigator - someone who uses "science" to combat such unknowable horrors. Any word on feat tax removal rules being used, or leaving everything PFS-like? Last edited by Krow Nest; 12-28-2018 at 03:10 PM. Essentially what is written here. Edit: Thank you, this will make a cleaner character sheet. Last edited by Vaerdis; 12-28-2018 at 03:24 PM. Putting down some interest, though unsure about what I'm going to play. I'll have to think, but I do have some ideas. ooooh, i love me some horror!! definitely interested!! Description: Stands on the short side 5’4. Her hair is light chestnut, shoulder length . Her milky cataracts stand out over her blue eyes. She tries to dress stylishly, and practically, but generally failing. She’s always upbeat, but it’s clear she’s not all there. Backstory:Sule and her older brother were inseparable. They made it through the orphanage with no permanent damage. As soon they could get out they did, even if it meant that they had to live in the back doorway of a shop and her brother had to do dirty odd jobs. It took time, but they got better jobs and better accommodations. Sule's odd appearance gave rise to the belief that she might be gifted. Pretty soon they were grifting people using a faith healer scam. They were starting to do ok, when the Rising Dawn found them. The Rising Dawn was an anarchist group that fronted as a community nonprofit. THey made Sule their new poster child. Soon she was rubbing elbows with the middle class and occasional minor noble, performing seances and making vague spiritual statements. It seemed like the world was just perfect right up until some of the people she had gotten to know disappeared. Sule didn't understand what she had done wrong, until the headlines came in that there was a large number of deaths in the market. It came as a huge shock. Sule always thought she was a good person. Nothing made sense anymore so she ran away. A priest eventually found her outside a church and brought her in. She spent the next year there. Sule was truly broken. Her time allowed her to pick up most of the pieces, as well as discover real powers. She vowed to try to make up mistakes. She left the city. She needed a fresh start. She didn't know if her brother even survived the backlash from the massacre. She was going to figure out how to use her new powers. Last edited by loganic; 12-30-2018 at 04:55 PM. Really interested in this game, as I am excited about the general theme, expected posting rate, and discord server use. I want to submit an app, and am wondering if your would allow Occultist and Tiefling?